911uk.com - Porsche Forum : View topic - Stuck handbrake? 911uk.com Forum Index > 996 (1997 - 2005) > Stuck handbrake? Posted: Mon Nov 26, 2018 8:50 am Post subject: Stuck handbrake? Driving home on Friday (last time before being taken off road for winter!) the car made a horrible clonk/thud noise before feeling like I was dragging 10 bags of sand behind me. Luckily I was less than a minute from home, pulled onto the drive and the left rear stopped rotating and dragged across the gravel. The right rear also started spinning up - probably due to the gravel and the left being held. Under closer inspection the disc and painted bit had tinted a blue colour. This tells me it got very very hot! See photo. Due to a busy weekend I’ve not had much chance to look at it. Planning on “working from home” tomorrow so inevitably I’ll get an hour to start breaking it apart. What’s people’s thoughts? Failed/stuck handbrake? Caliper? Worse?! 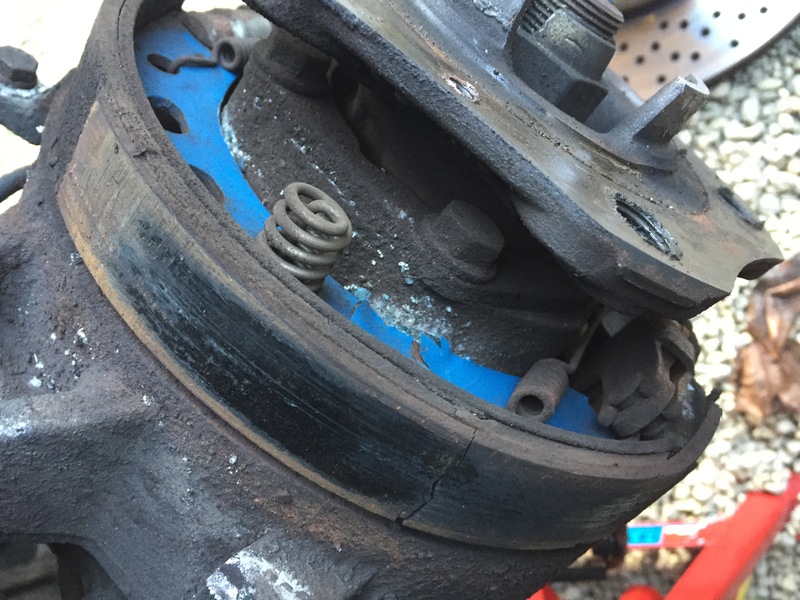 Assume best course of action is wind the handbrake back and get the caliper off and disc? 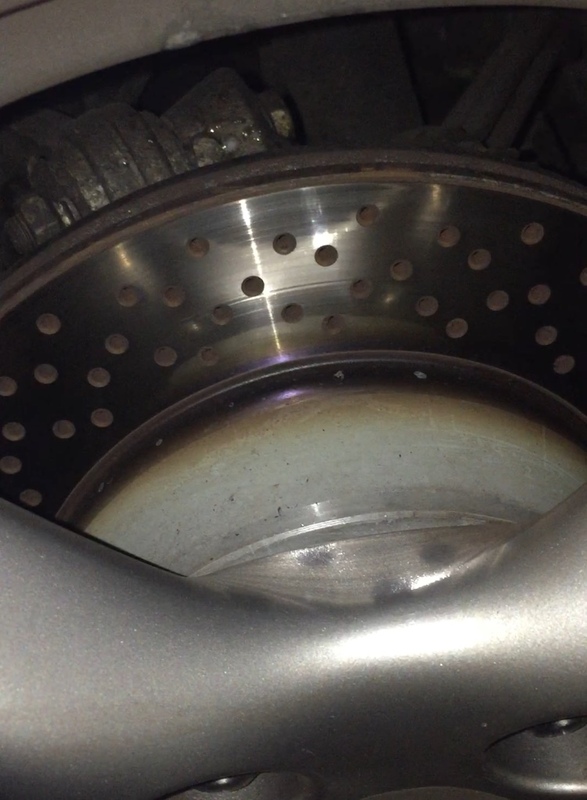 Check for obvious things like seizure of calipers (you should be able to spin the rear wheels by hand with the car jacked up) but it sounds a bit like a fault with PSM, which is braking a rear wheel to stop it rotating. How does the handbrake engagement feel? Pretty odd though as the mechanism requires a pulling force to be applied to engage it e.g. lifting the handbrake handle to tighten the cable. So you'd expect it to fail in the open / released position. The only thing I can think of it catastrophic failure of the brake shoe retaining mechanism and the shoes have jammed. Do let us know what you find! Something in the drum part of the has jammed. If they're old shoes then maybe some material has crumbled off and jammed, or again if old, a spring may have snapped and wedged itself. I'm sure it'll become obvious once you whip the disc off. Thanks all, seems like some possibles. Not sure fixing the PSM is a driveway/garage job! Yikes! Hopefully it’s just handbrake related - will get it off tomorrow and post some pics! 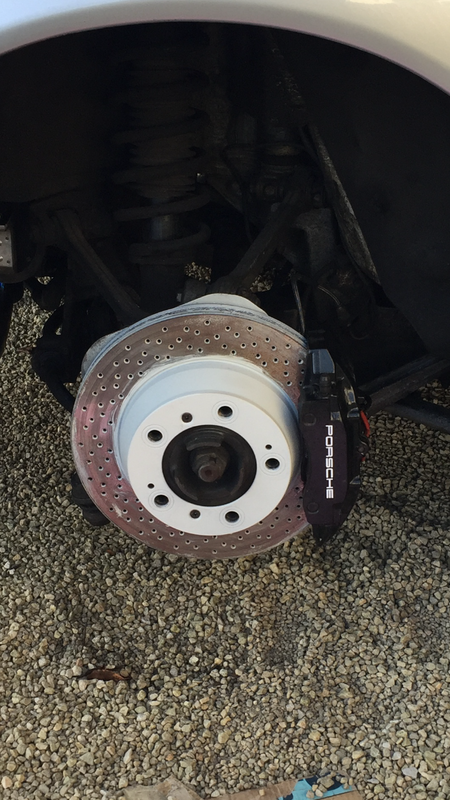 Disc off and see whats going on with the handbrake shoes . Finally got around to removing the disc...pictures speak for themselves! Popped the new shoes in, both sides and all went well. Adjusted handbrake, all fine. Took it out for a drive and then bang, same horrible sounding noise as before and the car ground to a halt. 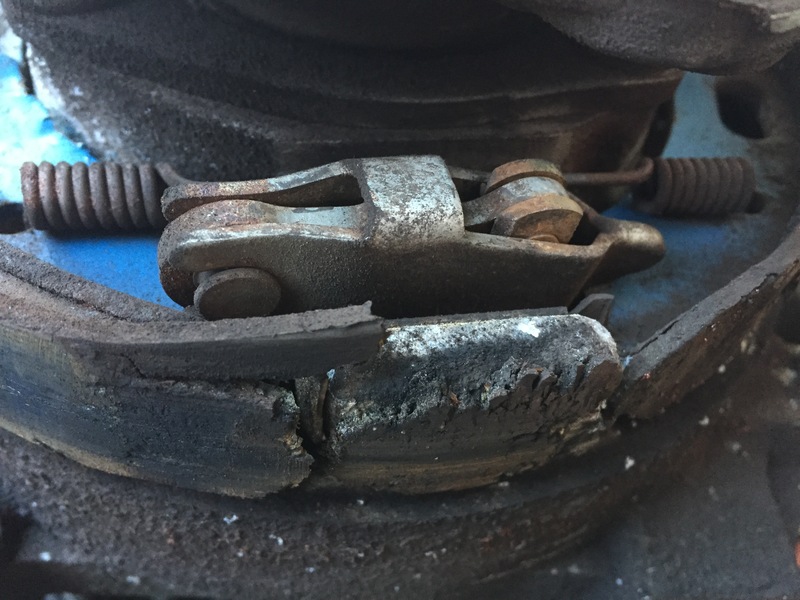 A 15min wall home and tools in the other car allowed me to whip the wheel and disc off again to discover something else had broke (see attached). Snapped clean off and had got itself wedged inside the disc. Everything went back together dead easy but clearly the spring plate thingymajig must’ve been weakened from the first failure of the shoe. Lesson learnt - buy new handbrake hardware!! Managed to free it up and drive home. Just no handbrake. So it’s been cleaned and tucked away in the garage now until well into next year on its winter hibernation. Too cold to be sat spannering on the driveway. Will order the bits and await a 10deg.c day! All went together fine, even had time to repaint the disc! This is the offending pivot plate that has snapped. (Photo of original shoe failure). If they sell it as a part then assume it must be able to be removed?! Aghh okies .. i thought it was the ally bracket the shoes rest on .. thats part of the hub .. the link is for the mechasnism that operates the shoes .. that is seperate and easily replaceable . Phew! That’s reassuring, thanks deMort. Just in case you ever need it . Thanks DeMort, I may take you up on that!